Terrific Fibers: Where did November go???? and then December? Where did November go???? and then December? November started with a TRIP! 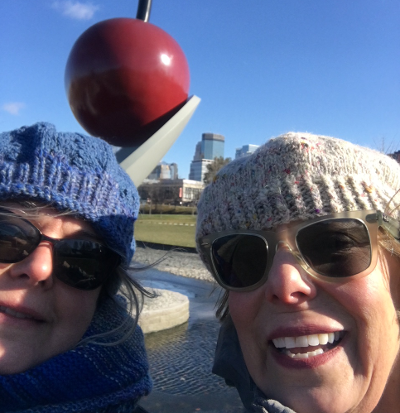 I had a wonderful time traveling to Minneapolis to visit my good friend, Debbie! She and her husband Jim saw to it that I had a wonderful time. They are great hosts!!! 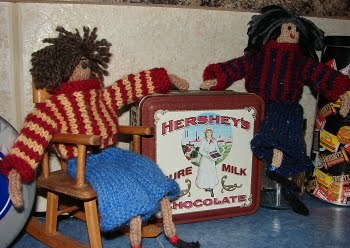 Debbie and I are knitting buddies and we have known each other since about 1996(? ), well forever. Even though it was 20 degrees outside(wind-chill of 5) we went to see the outdoor exhibit at the Museum of Modern Art. I was so excited to be able to enjoy cold weather and wear my hand knits, I piled them all on at one time. At one point you could hardly see me!!! After de-icing the plane, in Minneapolis, I arrived home safely to temperatures near to 80! Too funny!! Christmas decorations started going up after Thanksgiving and I was SO HAPPY to see my neighbor put these Peanuts characters up again! I see them everyday when I leave the alley behind my house. They just make me smile. 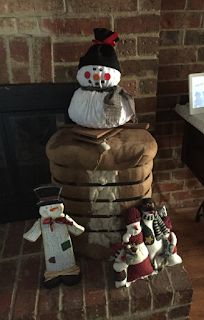 My friend Renee has blessed me this year, with 2 gifts. 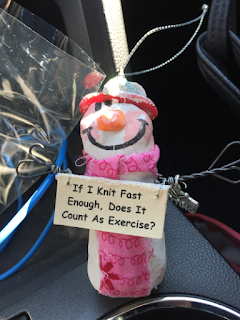 First is my little snowman ornament. She and I both exercise and try to stay in shape and good health. 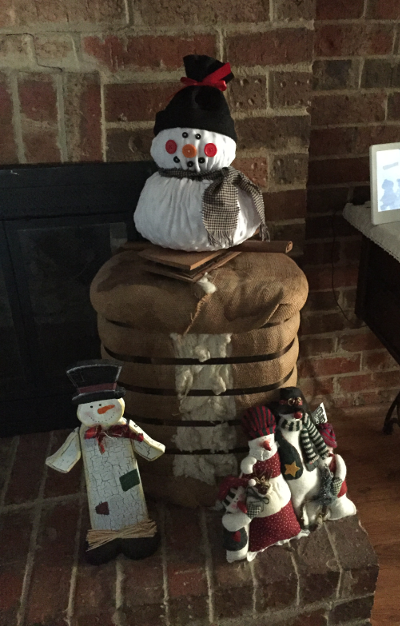 Then she made the snowman which is on top of the bale of cotton and cotton carders, that sits on my hearth. I set up the Christmas tree before Thanksgiving. I knew I would be working at our store for the Christmas rush and decided I would get it up before I started. 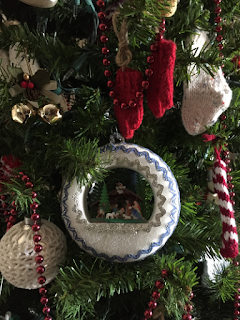 So, I did get the tree up and the house decorated, by Thanksgiving. But, I didn't get the ornaments on the tree. On Thanksgiving Day our daughter Rebekah and her family came over and Claire decorated it with some help from her sister, Nicole and her mom. This picture is the center of the very front. When we were first married, my mom and Mark, the little boy she cared for, made this nativity ornament for me. I always put it at the center front of my tree. Because, that is what Christmas is all about, the birth of Christ. Without realizing it, I did start a tradition. 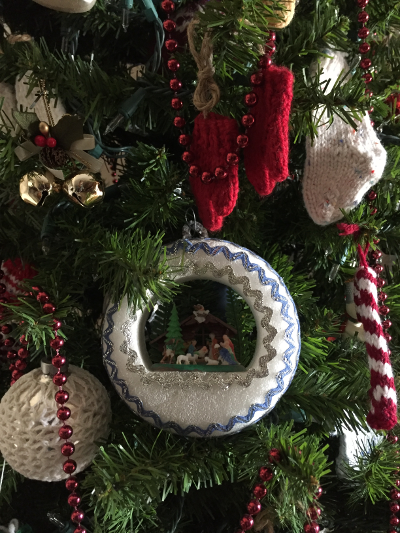 :) Both of my girls do the same on their trees, an ornament picturing the stable is in the center of the front of the tree. Christmas presents are all done now and wrapped. Didn't get pictures of some, will try to do that tomorrow(when they are unwrapped). However, while working I received an order for 2 scarves from a customer. She wanted them to be similar colors. 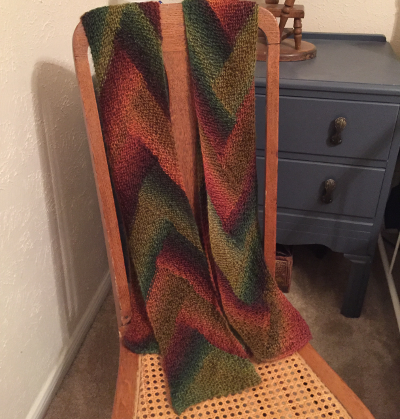 I decided to make this Pioneer Braid Scarf, with some self striping yarn from Red Heart yarns.